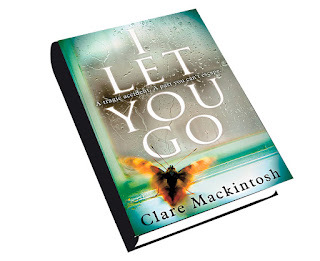 I've known Clare Mackintosh since she was "More Than Just A Mother" blogger, Emily Carlisle. We've blogged alongside each other, attended conferences together and both written about vibrators (although her story is much funnier than mine). #ILetYouGo by @claremackint0sh is bloody brilliant! In the words of Melchett (Blackadder) : it twists and turns like a twisty turny thing. It was an honour to be asked to be one of the five people hosting content from Clare on her "blog book tour" during the Spring Half Term and I really wanted to do something different with her. Knowing that we'd not had a proper 'real life' chat for a long time, I asked if she'd mind being interviewed via Google Hangout. She agreed more or less immediately. So, the other day, we sat down in our respective houses and, via the magic of t'internet and webcams, we produced the lovely relaxed half-hour chat you can see in this video. We talk about the relevance of a cover to the storyline of a novel, how Clare's day is structured when writing, who inspires her, what she is reading at the moment (and what her 'comfort read' is) and I managed to get her to share her three top tips for writers of all ages. We hope you enjoy the video (note: Clare was drinking wine, I was drinking Vimto - one of us didn't get the memo...) and please scroll down further to exclusively read the first chapter of I Let You Go, kindly reproduced, with permission, from Clare and her publishers, Little Brown Book Company. Detective Inspector Ray Stevens stood next to the window and contemplated his office chair, on which an arm had been broken for at least a year. Until now he had simply taken the pragmatic approach of not leaning on the left side, but while he was at lunch someone had scrawled ‘defective’ in black marker pen across the back of it. Ray wondered if Business Support’s newfound enthusiasm for equipment audits would extend to a replacement, or whether he was destined to run Bristol CID from a chair that cast serious doubts over his credibility. Leaning forward to find a marker pen in his chaotic top drawer, Ray crouched down and changed the label to ‘detective’. The door to his office opened and he hastily stood up, replacing the lid on the pen. Ray stretched out a hand for the piece of paper and scanned it, while Kate stood awkwardly in the doorway. Fresh from shift, she had only been on CID for a couple of months and was still finding her feet. She was good though: better than she knew. ‘Are you all right to stay late?’ Ray asked, but Kate was nodding before he’d even finished the question. They exchanged half-smiles in mutual acknowledgement of the adrenalin rush it always felt so wrong to enjoy when something so horrific had happened. ‘Will do.’ The older man took a final drag of his roll-up. Detective Sergeant Jake Owen had been called Stumpy for so much of his career that it was always a surprise to hear his full name read out in court. A man of few words, Stumpy had more war stories than he chose to share, and was without a shadow of a doubt Ray’s best DS. The two men had been on shift together for several years, and with a strength that belied his small stature, Stumpy was a handy crewmate to have on your side. Kate drove the unmarked Corsa through mounting rush-hour traffic to Fishponds. She was an impatient driver; tutting when a red light held them back, and craning her neck to see past a hold-up. She was perpetually in motion: tapping fingers on the steering wheel, screwing up her nose, shifting in her seat. As the traffic started moving again, she leaned forward as though the movement would propel them forward faster. ‘Missing blues and twos?’ Ray said. Kate grinned. ‘Maybe a bit.’ There was eye-liner smudged around her eyes, but otherwise her face was clean of make-up. Dark brown curls fell messily about her face, despite the tortoiseshell clip presumably intended to hold them back. Ray fished for his mobile to make the necessary calls, confirming that the Collision Investigation Unit was en route, the duty superintendent had been informed, and that someone had called out the Ops wagon – a lumbering vehicle stuffed to the gunnels with tenting, emergency lights and hot drinks. Everything had been done. In all honesty, he thought, it always had been, but as duty DI the buck stopped with him. There was usually a bit of hackle-rising from shift when CID turned up and started going over old ground, but that was just the way it had to be. They’d all been through it; even Ray, who had spent as little time in uniform as possible before moving on. Kate had stopped on their way out of the station to grab a coat and exchange her heels for wellies. ‘Practicality before style,’ she had laughed, throwing the shoes into her locker and pulling on the boots. Ray rarely gave much thought to either principle, but he wished now he’d at least brought a coat. They parked the car a hundred metres away from a large white tent, erected in an attempt to protect from the rain whatever evidence might have been left. One side of the tent was open, and inside they could see a Crime Scene Investigator on her hands and knees, swabbing at something unseen. Further up the road a second paper-suited figure was examining one of the huge trees that lined the road. ‘He’s at the mother’s house,’ the PC said. He pointed down the street to a row of small terraced houses, before retreating into his collar. ‘Number four,’ came the muffled afterthought. They reached the row of houses the PC had pointed towards. Kate carried on talking as they looked for number four. ‘In the sitting room,’ came the response. They wiped their feet and walked up the narrow hallway, pushing past an over-loaded coat rack, beneath which sat a pair of child’s red wellies, neatly placed beside an adult pair. Perched on a kitchen chair next to the sofa, a uniformed sergeant was balancing paperwork on his lap. Ray had seen him around the nick but didn’t know his name. He glanced at his badge. ‘I couldn’t see inside,’ she said. ‘I couldn’t see inside the car,’ she repeated, her voice dull and wooden. ‘Right,’ said Ray. Where on earth were they going to start? Her voice cracked and the words fell apart, morphing into a low moan. She bent forward, hugging the school bag into her stomach, and Ray felt a tightening in his chest. He took a deep breath, forcing the feeling away. ‘We’ll do everything we can,’ he said, despising himself for the cliché. Kate came back from the kitchen with Brian behind her, carrying a mug of tea. ‘All right if I finish this statement now, guv?’ he asked. ‘Are you okay?’ he asked, although it was clear she wasn’t. Her jaw was rigid; the colour had completely drained from her face. ‘Fine,’ Kate said, but her voice was thick and Ray realised she was trying not to cry. ‘Hey,’ he said, reaching out and putting an awkward arm round her shoulder, ‘is it the job?’ Over the years Ray had built a defensive mechanism against the fall-out of cases like this one. Most police officers had one – it’s why you had to turn a blind eye to some of the jokes bandied about the canteen – but perhaps Kate was different. She nodded and took a deep, juddering breath. ‘I’m sorry, I’m not normally like this, I promise. I’ve done dozens of death knocks, but . . . God, he was five years old! Apparently Jacob’s father never wanted anything to do with him, so it’s always been the two of them. I can’t imagine what she’s going through.’ Her voice cracked, and Ray felt the tightness in his chest return. His coping mechanism relied on focusing on the investigation – on the hard evidence before them – and not dwelling too deeply on the emotions of the people involved. If he thought too long about how it must feel to watch your child die in your arms, he would be no use to anyone, not least to Jacob and his mother. Ray’s thoughts flicked involuntarily to his own children, and he had an irrational desire to call home and check they were both safe. ‘I’ll be fine. Thank you.